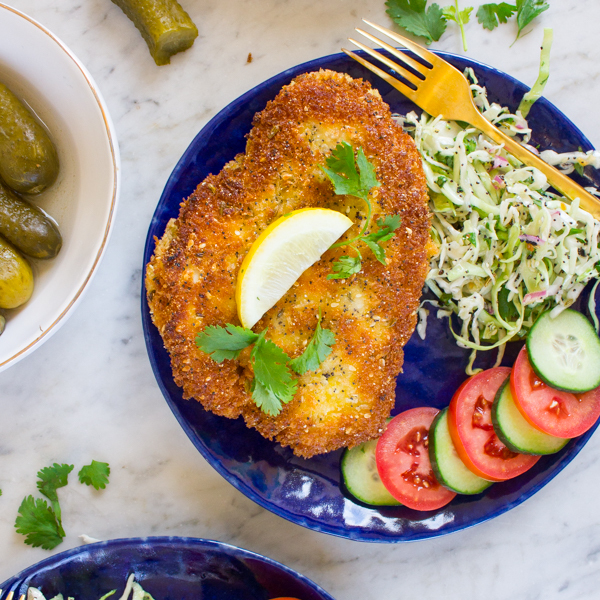 Pickle-Brined Schnitzel with Everything Slaw is your dinner tonight! 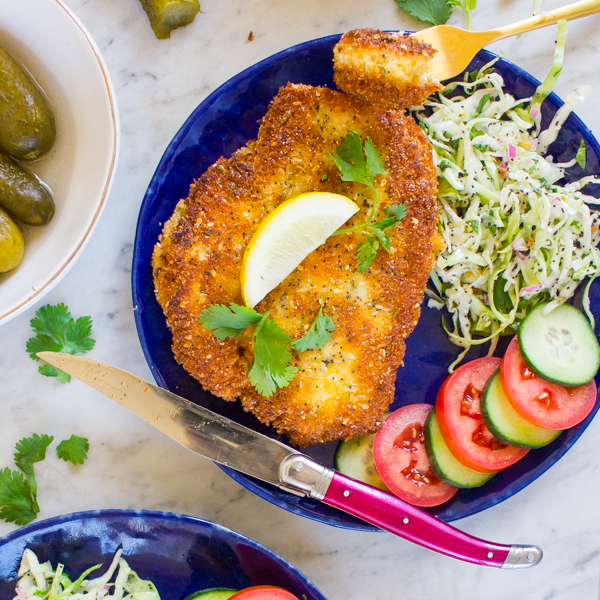 Schnitzel in the morning, schnitzel in the evening, schnitzel at supper time. 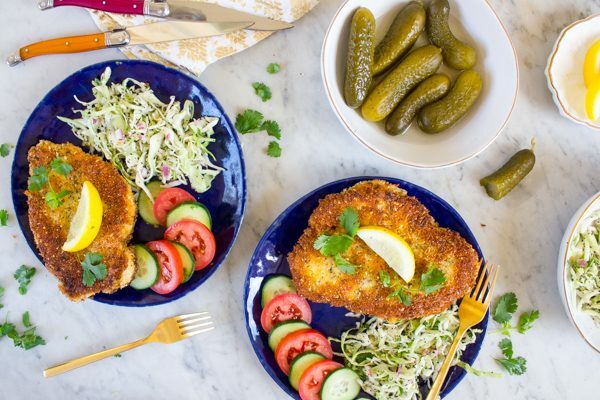 When chicken is brined in pickle juice you can have schnitzel anytime! True story. I had this schnitzel for breakfast, lunch, and dinner. It’s quick, easy, but so tasty. With briny, moist chicken and a tangy slaw. And after a weekend winery hopping (so fun), it was exactly what I needed. I had some tasty schnitzel in Prague with a horseradish slaw on the side, so inspired by that combo, I made everything bagel slaw (of course!) My new and forever favorite spice. 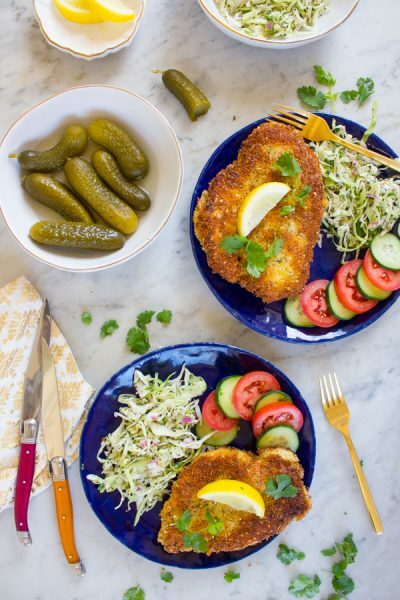 A squeeze of lemon and a dollop of mustard or spicy mustard and dinner is served. Schnitzel history (schnitzeltry?) starts off in Austria as veal, and moved to Israel as we moved there and became chicken! Cheaper and still kosher. Oftentimes fried chicken is brined in buttermilk to tenderize, but that’s not exactly kosher. So I took a nod to my favorite snack, and brined mine in pickle juice! Whoa. The result was super tender, flavorful schnitzel. And an excuse to eat all the pickles! What else can I brine in pickle juice??? 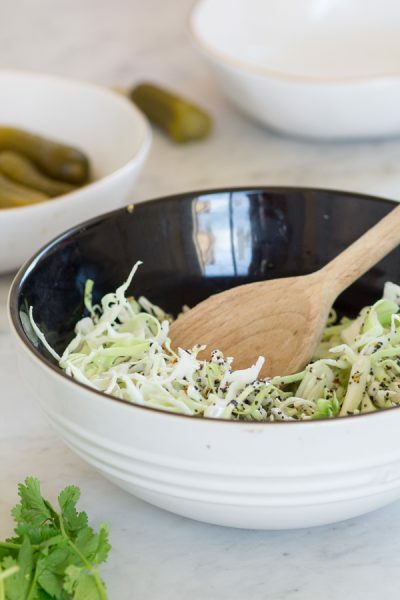 While your chicken is brining, you can whip up your slaw. Easy! Red onion, apple cider vinegar, EVERYTHING BAGEL SPICE! Fry, baby, fry and dinner is served! 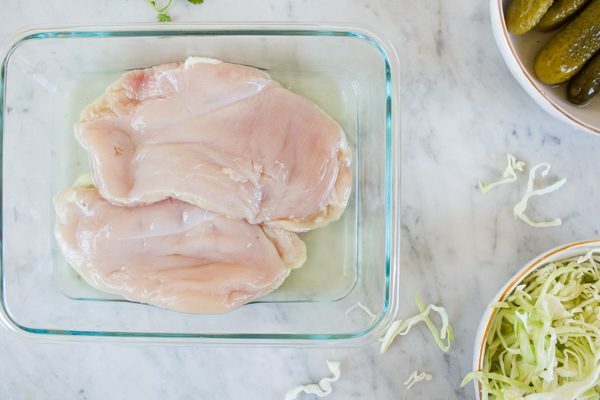 Place a large piece of plastic wrap on a counter or cutting board and place the chicken breasts down, spaced a few inches apart. Cover chicken with more plastic wrap and pound to about ¼ inch thin with a mallet or heavy pan. Take out your anger! Put pounded chicken in a medium bowl and pour pickle juice on top. Toss chicken in juice and refrigerate for 30 minutes, rotating a few times. 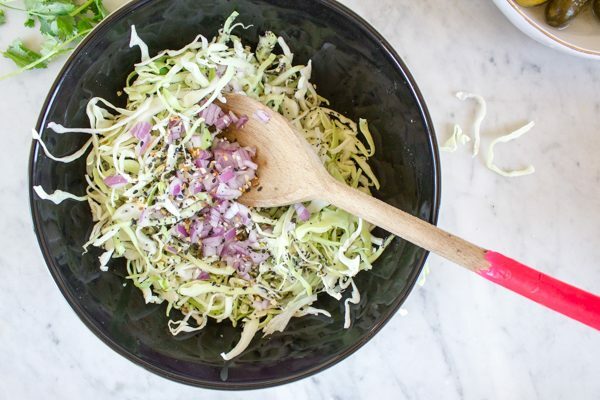 While chicken is brining, make the slaw! Mix all ingredients together in a large bowl and refrigerate for 30 minutes to marinate flavors. When the chicken is ready, dry well. Put the flour, whisked egg and Panko each in separate shallow bowls. Season the flour with ½ teaspoon kosher salt and season the Panko with 1 tablespoon Everything Bagel Spice. Heat ½ inch oil in a 12-inch saute pan over medium heat until 375 degrees F.
Meanwhile, coat each chicken breast in flour, shake it off, then egg, drip it off, then Panko. Use alternative hands for the dry and wet dipping so your hands stay clean-ish! 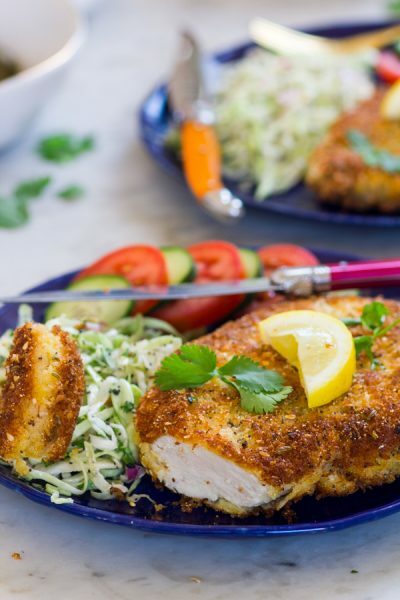 Fry chicken breasts in oil 2-3 minutes per side or until golden brown. 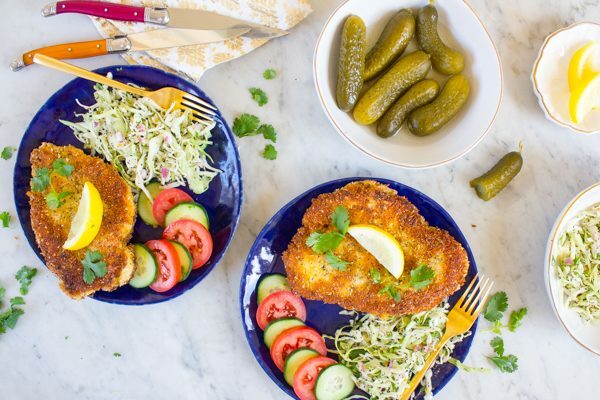 Blot fried chicken on a paper towel and serve hot with slaw and garnishes. why not veal, especially in Prague? Or Munich? They had veal there! But I like making chicken! Thanks, Rida! I love pickles too, with vinegar though! I love making chicken schnitzel. But panko? Feh. 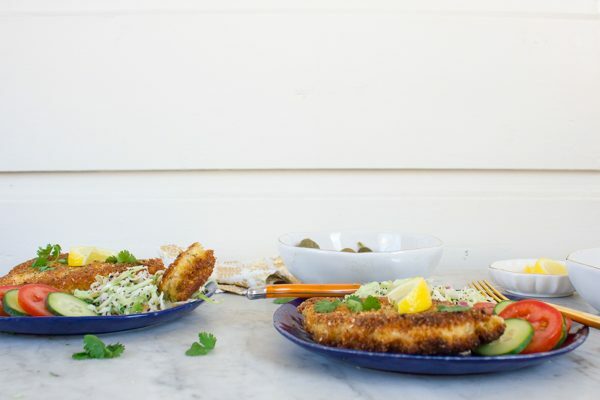 The best breading for chicken schnitzel is matzoh meal. Keep the panko for tempura. Matzah meal is a great option too!! Wonderful! Ha I’d make it every week then!